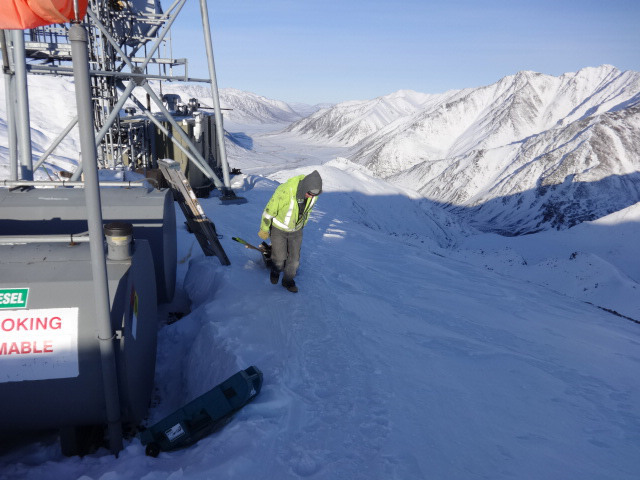 NRC Alaska was called to respond to the site of a diesel fuel spill located in Atigun Pass deep in the Brooks Range. 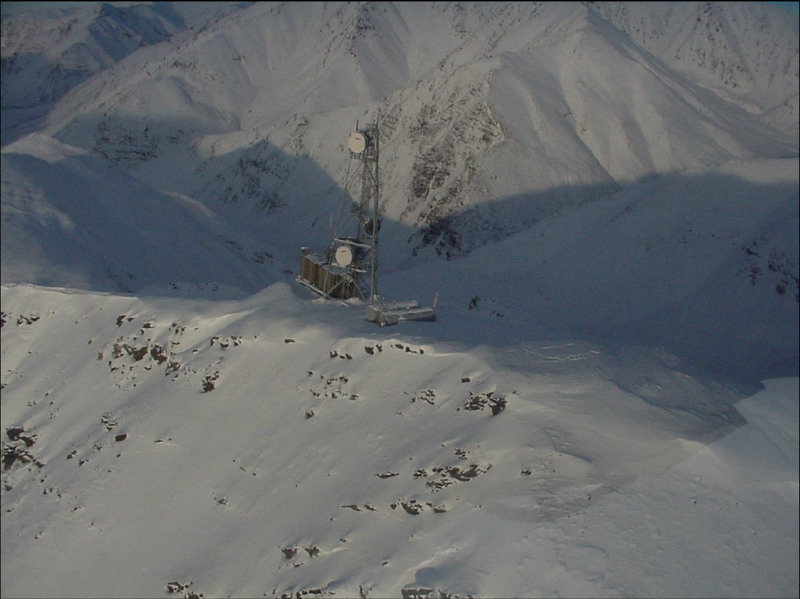 AT&T’s Repeater Facility Site is 236 miles NNW of Fairbanks at Mile Marker 250.7 James Dalton Highway. Less than 4 hours/day of daylight. Extremely remote location only accessible by helicopter, complicated mobilization of equipment and supplies. 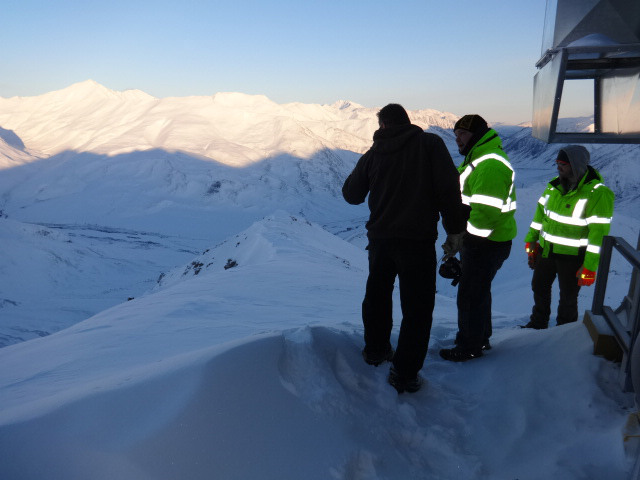 An elevation of 6,000+ feet above sea level and ~3,000 feet above the Dalton Highway in the valley below equated to thinner air resulting in rapid fatigue and dizziness for the response crew. Strong winds, cold temperatures and wind chill factors. The spill of 100-120 gallons of diesel fuel originated inside the building and leaked out at the northeast corner. In order to remove the spilled fuel from underneath the structure, NRC staff mined out an entryway under it due to limited space between the bottom and the ground surface. The 15 yards of contaminated soils removed from the site was packaged into 30-gallon drums in an effort to control the weight distribution and improve handling. The helicopter can carry only 2 workers and 300 lbs. of equipment (or sling 1,500 to 1,700 lbs. of equipment) at a time from the road to the top of the mountain where the site was located. 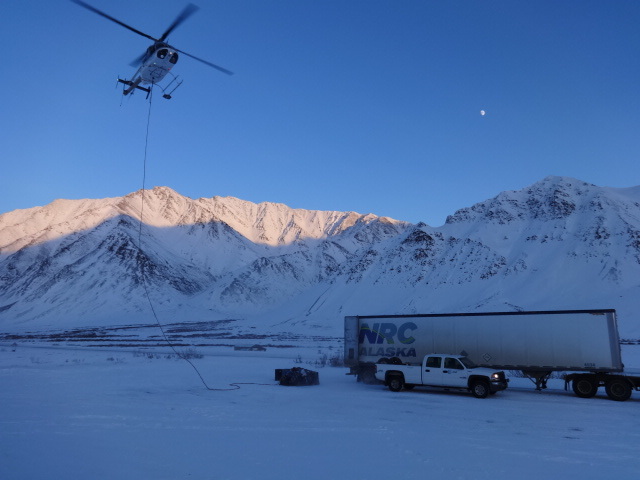 NRC Alaska completed the response in 4 days without incident. Gross contamination was removed, packaged, transported off the site and properly treated and disposed of at NRC Alaska’s Anchorage facility. The site was covered with sorbents, boomed, covered with a layer of poly sheeting and then secured with plywood to hold over until summer. Removal of 100-120gallons of diesel fuel. Project completion in 4 days, enduring cold temperatures, wind chill factors, and remote access to project site.